Abbas Kiarostami´s "Shirin" (2008) is the very model of simplicity, constructed entirely (aside from the opening and end credits) of a series of close-up shots of women in a theater watching a film. Well, not exactly. The actresses were actually filmed in small groups while sitting in Kiarostami´s living room, and they weren´t really watching a movie. In fact the movie doesn´t exist at all except as an audio track which was recorded after the actresses´ performances were filmed. So scratch that simplicity business. Chalk "Shirin" up as another of Kiarostami´s deceptively complicated, multi-layered meditations on life, the cinema and everything. We shouldn´t expect anything else from the director of “Close-up” (1990) and "A Taste of Cherry" (1997). On the surface there seems to be something perverse about Kiarostami´s decision to work with a cast full of professional actors for the first time, and then to plop each of them in a living room chair and have them "simply" (that word again!) stare ahead as if watching a movie. Yet as revealed in the wonderful making-of documentary ("A Taste of Shirin") included on this DVD, these big-name stars of Iranian cinema (plus Juliette Binoche, perhaps prepping for her role in Kiarostami´s "Certified Copy") are not only acting, but pushing their craft into previously unexplored territory. As Kiarostami says to one of his performers: "You are now the spectator of movies you have been playing for years." This is surely a role none of them expected to be playing on screen, and the director doesn´t make it easy, paradoxically micromanaging them ("move your chin up") then asking them to create their own inner movie and express any resulting emotions with their eyes. Cinema Guild has included two other Kiarostami short films on this disc which share the same formal concerns as the main feature, namely the intent study of images we rarely, if ever, get to scrutinize on film. In "Roads of Kiarostami" (2006), the director films not just roads but primarily his own photographs of roads winding through the countryside. We have seen images like this before even in Kiarostami´s own work (the winding road up the hillside in the 1987 "Where Is The Friend´s House?" being a standout) but the close "aerial" study of these two-dimensional photographs provides a unique perspective on these sinuous forms, appreciated for their formal beauty rather than their more pragmatic function. In "Rug" (2006), Kiarostami travels the "roads" of a Persian rug, the camera tracking its intricately woven patterns first in a counter-clockwise circle (or square, following its shape) then panning up and down before zooming out for a broader view. In "Shirin" he studies the roadmap of the face, faces of women both younger and older, faces framed by head scarves that are limned by the flickering light of the faux movie screen. For me, one of the greatest pleasures in cinema is watching people while they are watching or listening to something off-screen; absorbing, learning, thinking. Godard´s cinema is replete with such instances, the most famous being Anna Karina watching "The Passion of Joan of Arc" in "Vivre Sa Vie." The inherent creepiness of watching Danny watching a Roadrunner cartoon in "The Shining" also springs to mind. Kiarostami´s film takes this aesthetic to a whole different level. The faces in "Shirin" tell a gradually unfolding story that relates to the story being told off-screen. 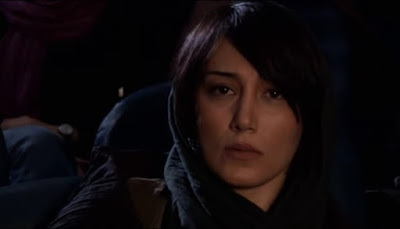 Kiarostami´s audio movie is based on the medieval poem "Khosrow and Shirin" by Nizami Ganjavi, a tragic love story (the only kind) about a woman (Shirin) pursued by a king and an artist. 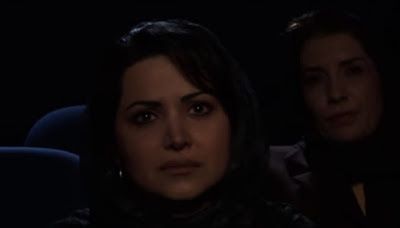 What we hear suggests that this is a purely commercial melodrama which explains why it´s playing in a public theater rather than to a festival crowd like most of Kiarostami´s work. At first, the women´s faces are either impassive or pensive as they reserve judgment about the film, but they turn more expressive, tears eventually flowing as they are seduced by its pathos. Not that any of them were watching a film, of course. When an actress appears to be jolted by a sudden event on screen, she was actually startled by the director dropping a pan. Any trick to get an "authentic" reaction. Perhaps Kiarostami is contemplating the relationship of his own contemplative, occasionally abstract work to the seductive power of narrative cinema. I'm not ready to venture into that interpretive mine field just yet. What I´m left with instead is the surface level, memories of a series of women´s faces looking ever so slightly off-screen (I don´t recall anyone´s gaze meeting the camera) giving us the opportunity to observe them as they observe a non-existent film. How beautiful. How fascinating. And, in the end, yes, how simple this film´s charms. The film is presented in a 1.78:1 anamorphic transfer from Cinema Guild. The widescreen image is windowboxed for some reason, but otherwise I have no complaints. It´s tempting to carp a bit about how dark some of the images look, but this was meant to look like it was shot in a theater so obviously there are times that faces are going to disappear somewhat into the shadows. The flickering light sometimes shows up as looking a little blotchy on the ´theater seats" in the film, but this is a solid transfer all around. The film is presented in Dolby Digital 2.0. If there is anything I was somewhat off put by, it´s that the film (dialogue and FX) we hear off-screen sounds more like a live radio play than a movie heard in a theater. When you see how the audio was recorded, it´s obvious why this is the case, so I think the sound is well replicated on this mix. English subtitles are provided to support the Farsi audio. With its simple black cover and stripped-down menus, this DVD initially appears to be a no-frills release, but the extras included by Cinema Guild are superb. First up is the excellent "making of" documentary "Taste of Shirin" (2008, 27 min.) by Hamideh Razavi. As much as any "making of" featurette I can recall, this fits hand in glove with the main feature and can significantly transform your viewing experience. It shows Kiarostami at work with his actresses both in front of the camera and later in the audio booth. What a treat for Kiarostami buffs to now have two of his recent short films available in Region 1. "Roads of Kiarostami" (2005, 32 min.) is a natural development in the director´s lifelong passion for filming long, zigzagging roads. In this short, he shoots some moving images of roads, but mostly focuses on photographs (that I assume are his own) of roads, combined with a contemplative voice-over. There is also a brief video passage of Kiarostami on the road trying to capture some images. "Rug" (2006, 6 min.) is a close-up study of the surface of a Persian carpet accompanied by audio of a man and women reciting poetry. It is quite lovely. The extras are important simply for making Kiarostami´s short films available on DVD, but they also happen to fit seamlessly together. As mentioned above, all three Kiarostami films (the shorts and "Shirin") show the director´s interest in focusing on images seldom privileged on screen. As a group, these films offer a great perspective on the last five years of this Kiarostami´s thematic and formal concerns. The slim insert booklet features an insightful two page essay by Jonathan Rosenbaum, one of America´s most eloquent and passionate critical champion of Abbas Kiarostami´s cinema. "Shirin" may be Kiarostami´s most experimental feature to date, but it´s as accessible as any of his films. 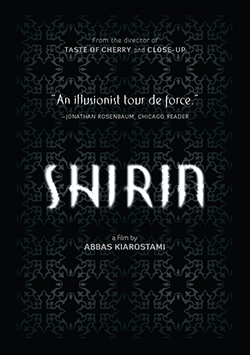 Bolstered by the well-chosen extras, "Shirin" is yet another great release by Cinema Guild, and strongly recommended.